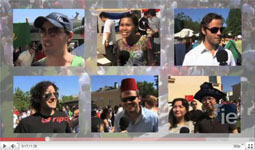 IE Business School - International MBA | IE Business School’s Global Village 2011 opens today! IE Business School’s Global Village 2011 opens today! Cultural diversity is a key feature of studying at IE Business School. With around 85 different nationalities studying on campus, how could it not?! One of the ways we like to celebrate our diversity is through Global Village. Organized by the NetImpact club, Global Village is a one-day event hosted on our campus in Madrid where students prepare food and activities from their respective countries to share with the rest of the IE community. The atmosphere is fun and relaxed and students are welcome to bring their partners and children along to enjoy the event as well. Check out the action unfolding through our Alumni twitter! You may also click here for a video of last year’s Global Village. Dust BioSolutions wins IE Business School Venture Day!IE Business School takes over MBAT!